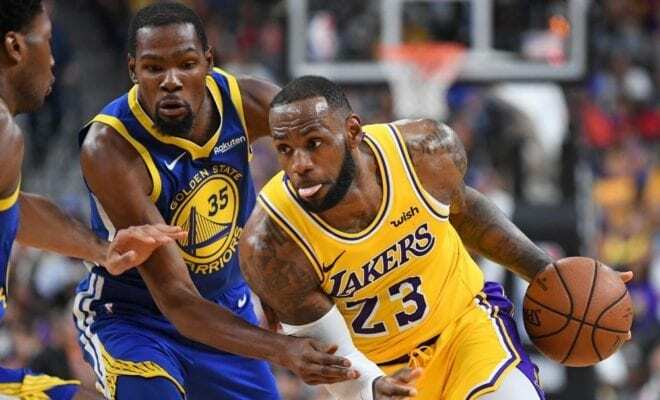 There’s a growing perception that superstar players are reluctant to team up with LeBron James, and one subscriber to that school of thought is Kevin Durant. Speaking with Bleacher Report this week, Durant said there were a lot challenges that came with playing alongside LeBron as a fellow star. “It depends on what kind of player you are,” Durant told Bleacher Report. “If you’re Kyle Korver, then it makes sense. Because Kyle Korver in Atlanta was the bulk of the offense, and he’s not a No. 1 option at all, not even close. But if you’re a young star? “If you’re a younger player like a Kawhi, trying to pair him with LeBron James doesn’t really make sense,” Durant said. Just ask Kyrie Irving and Kevin Love how hard it was to adjust to playing with the King. They both got a championship out of it, but Irving soon couldn’t stand living in LeBron’s shadow and Love went from a bonda-fide superstar to a glorified spot-up shooter. While it’s hard to knock back the chance to compete for a title, joining LeBron’s team comes at a cost. So, will it be too steep a price to pay for the star free agents of 2019? That’s the question that will shape the future of the league.